The year of Chernobyl disaster - 1986. I was in the USA, had an exhibition in Chicago, and lived at the home of H. Yepstas. 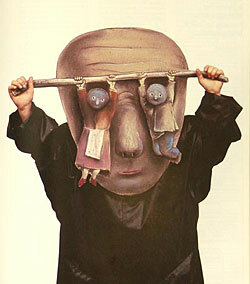 The walls of his hallway displayed wooden masks, at which l glanced occassionally. One day Henrietta said: "Couldn't you try doing something like that?". l did not think about it first. In time, however, the idea returned to me. I had a room for drawing, so I started with crayons. The first series emerged. Another one in Los Angeles, yet another in New York. I noticed interest in them. 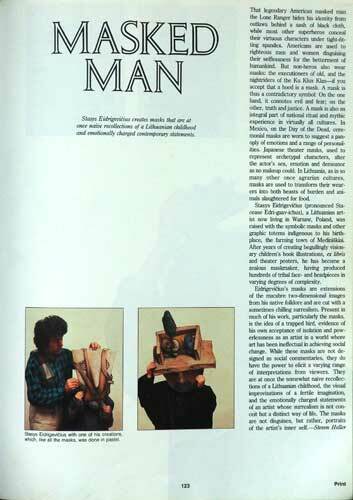 The "New York Times" critic Steven Heller published an article called "Masked Man" in "The Print Magazine". I did another series after returning to Warsaw. They became a new motif of my posters, and recently they have appeared in the book "Little Pig". 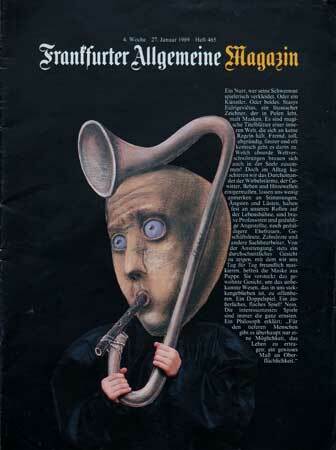 The German "Frankfurter Allgemeine Magazine" has published an extensive article on my masks.